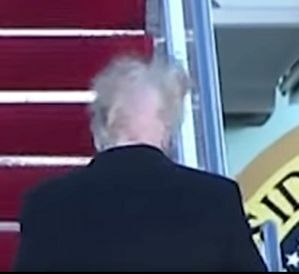 Plastic surgeons have been puzzling over the mysterious architecture of President Trump’s distinctive orange coiffure, after a strong gust of wind lifted Trump’s comb-over as he was filmed boarding Air Force One—exposing a large bald spot covering most of the back of his head. The video went viral on the internet and was the subject of much late-night talk-show humor. The president insists his hairstyle is all natural, but last week’s pictures appear to show an incision scar on the back of his scalp. His first wife, Ivana, has previously claimed Trump underwent scalp-reduction surgery in 1989—an outmoded process that involves cutting away bald scalp and stitching together the skin that still has hair. One plastic surgeon told TheDailyBeast.com that Trump’s scar was “very typical of a scalp reduction.” Others speculated that he has undergone multiple hair transplants and had follicles taken from the back and moved to the top and front.